Illuminated Manuscript, Saints' Lives, Walters Art Museum Ms. W.71, fol. 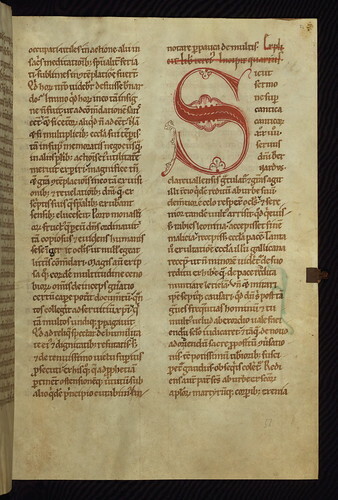 51r, originally uploaded by Walters Art Museum Illuminated Manuscripts. This manuscript, which was made at or for the Cistercian monastery at Himmerode, Germany, is a compilation of several texts written in the late twelfth or early thirteenth century. The first and third texts, William of St. Thierry's "Life of St. Bernard" and Hugh of St. Victor's "On the Lamentations of Jeremiah," are contemporary but were written separately and then bound together. A third text, Jacques de Vitry's Life of St. Marie d'Oignies, was inserted in between them at a later time. Several additional texts were added to blank pages in the thirteenth century, most notably a letter by Hildegard on the final folio. Many different hands can be identified throughout the manuscript, sometimes changing every few lines, and this variety of scribes is especially evident in the third text. Although the book contains no pictorial illuminations, large ornate foliate initials, drawn in bright green and red, announce the beginning of each chapter. good Share the video clips with just one click and also Mobdro.uk experience with no single ad.Conserve your videos to great.